For years, neurosurgeons have debated the merits of resecting gliomas radically and the controversy still rages on. With the evolution of neuro-oncosurgery as a subspecialty, the gulf between the proponents (of aggressive resections) and the opponents (conservative ones) have widened and battle lines seem to have been drawn, with each side claiming a victory. Should one be radical? If so, how much should be resected? Is it eventually beneficial? These are some of the questions which course through most neurosurgeons' minds when faced with a patient with glioma. In this commentary, I will try to discuss, rationalize, and distil the current evidence and thought process behind contemporary glioma surgery. Gliomas by their nature are diffuse and infiltrative. Microscopically, glioma cells have been shown to extend well beyond “normal” appearing brain parenchyma. Therefore, it may appear (and may very well be true) that gliomas can never be truly resected completely. The debate then seems to be a nonstarter. However, in the context of glioma surgery, the extent of the tumor is what is defined by the magnetic resonance imaging (MRI), and therefore, the goal of surgery remains elimination of all radiological abnormality. Herein lies the problem. Whereas contrast enhancing tumor component is not problematic to delineate, the nonenhancing (T2/fluid-attenuated inversion recovery tumor component) remains challenging to demarcate. Biological imaging techniques (MR spectroscopy/perfusion/positron-emission tomography) have improved our confidence in delineating tumors beyond the contrast enhancing rim, but still have a long way to go. Furthermore, tumor proximity to (or even involvement of) vital functional areas (eloquent areas) often precludes resections. Therefore, a combination of multimodal radiological imaging and functional assessment remains the gold standard on which the determination of “resectability” is based. Orringer et al. evaluated factors which may influence the surgeon's impression of tumor resectability and EOR. They found that large tumor size, eloquent location, proximity to periventricular areas, and left parietal location were all associated with poor EORs. Sonabend et al. used a novel crowd-sourcing technique with a Resectability Index (RI) metric to determine resectability and showed that it correlated well with eventual resections (EOR-as measured on MRI). Despite attempts at objectively assessing resectability, it remains a very subjective attribute. What may be resectable in one neurosurgeon's opinion may be clearly unresectable for another. In one study, the inter-rater concordance of resectability was just 37%. This variability in perception could be due to philosophy (”……gliomas are anyways incurable and hence only debulking is good enough”). This mindset is more a result of dogmatic training with little acknowledgement (and often active rejection) of evolving evidence to the contrary. Unfortunately, these notions are perpetuated and carried forward during practice and eventually cemented to form “philosophy.” Another reason could be the lack of wherewithal to deal with glioma surgery. Neuro-oncology has evolved into a speciality in its own right and glioma surgery should be considered a complex surgery demanding a high order of expertise (much like complex skull base, vascular, or spine surgery). Indeed, in most developed healthcare setups, neuro-onco surgery is a specialty in its own right. It has been shown that outcomes (EORs as well as survival) are better when resections are performed by large volume centers or by specialists. Familiarity with anatomical dissection techniques (subpial dissection, gyral resection, etc), access to and comfort with intraoperative image guidance adjuncts (navigation, intraoperative imaging-like ultrasound or MR), knowledge of enhanced visualization strategies (such as fluorescence guidance), and use of functional monitoring techniques is crucial to optimally manage a patient with glioma. Lack of training (often) and lack of access to these high-end adjuncts (more so in resource-constrained settings) are the major reason for suboptimal resections. Structured and focussed training (during general neurosurgical training as well as at the fellowship level) can overcome some of these lacunae. Sonabend et al. showed that when only neuro-oncosurgeons were asked to evaluate tumor resectability, they had a much higher inter-rater concordance. However, this concordance is still not 100%, and there still remains a group of gliomas where it may difficult to ascertain resectability a priori. So why is it important to recognize resectability? First, a priori determination of resectability reflects on the “intent” of the surgeon. Solheim et al. showed that when the surgeon's intent was radical, better resections were achieved. The more “prepared” and determined the surgeon, the more likely he is to achieve what he set out to and the results (EOR) are likely to be better. The surgeon, in such cases, is also more likely to use various appropriate and often necessary adjuncts in order to achieve the end result. If a patient is deemed “unresectable” incorrectly upfront, the patient may be deprived of a potentially beneficial intervention. A word of caution here-safe maximal resection remains the dictum always and should never be violated. 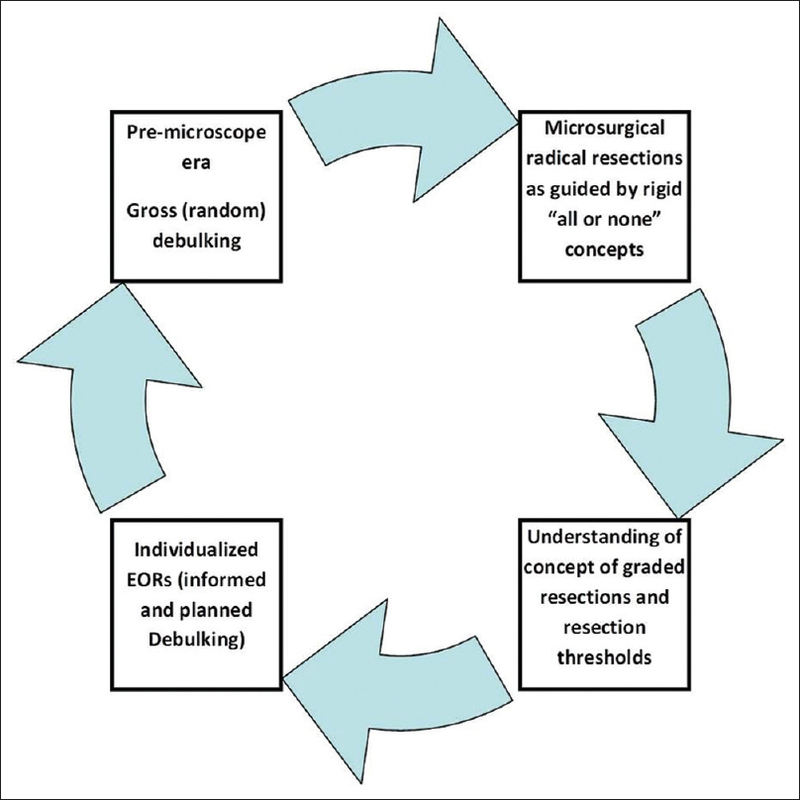 Second, in various clinical trials of surgical adjuncts (such as the ALA study and IOMR study), “resectability” is an important inclusion criteria and therefore having a reliable and reproducible criterion is important., Of course, the parameters used to determine this have to be objective and accurate (as discussed earlier). A crowd-sourcing metric (like the RI) or use of machine learning tools may help improve this assessment in the future. Having correctly assessed the resectability, are we able to then translate it into a better resection? The adage – “There's many a slip between the cup and the lip…” could not be more applicable here. Most often, surgeons do not perform postoperative MR and hence assessment of true residue is difficult. Even with meticulous postoperative volumetric MR monitoring, studies have shown that for so-called “potentially resectable” tumors, and surgeons are actually able to achieve the goal of complete resection in just a third of cases (as is seen in the control arm in the ALA study). One of the biggest problems we face is the challenge of delineation of true tumor volume. Therefore, intraoperative judgment of the completeness of resection can be erroneous. Orringer et al. reported that surgeons's were able to correctly estimate a complete resection only in 30% of cases. Furthermore, the estimate was most inaccurate in those resected radically (>90%) but not gross totally (100%), implying that it is this final stretch (resecting the last 10% or so) where most of us are likely to falter. Although it is possible that the surgeon may have erred in calling a particular tumor “resectable” (for example, tumor involving eloquent areas which cannot be resected), it is also very likely that the suboptimal EOR may be a result of inadequate intraoperative visualization of residual tumor leading to premature termination of the resection. This reinforces the necessity of intraoperative guidance during intra-axial tumor resections. Even for obviously unresectable cases, one may be surprised how often a radical excision may be achieved. Hence, it is obvious that once a glioma is deemed “potentially” resectable, one still needs to resect it as best as possible. The intent is only part of the process. Unless implemented well, it is unlikely to serve its actual purpose. It is here that the neurosurgeon's role is very crucial. Constant innovation and improvements in technical adjuncts have expanded the neurosurgeon's armamentarium. In the premicroscope era, surgical resection involved gross-free hand techniques. The introduction of the microscope revolutionized the way the neurosurgeon could operate. Still, the tumor-brain interface remains elusive. A combination of imaging adjuncts (ultrasound, MR) as well as visualization strategies (such as fluorescence), help overcome this limitation and hence can expand the definition of “resectability”. Eloquent brain areas pose a barrier, a virtual “no entry zone”. Use of functional monitoring techniques have enhanced our understanding and combined with emerging concepts of “hodotopy” and brain plasticity, have enabled neurosurgeons push the boundaries of resectability into the hitherto forbidden zones. Chang et al. showed that using intraoperative mapping allowed correct assessment of “true” eloquence (as opposed to “presumed” eloquence which was the case in almost 40% tumors) and this translated into a better outcome for patients. Interestingly, those that were not mapped (and therefore were labeled eloquent without actually confirming it by mapping), did as badly as those that were truly eloquent as proved by mapping. In resource-constrained settings like India, it may not be possible to have elaborate setups with all adjuncts. However cost-effective solutions exist such as a simple intraoperative ultrasound (for visualization) and awake mapping with electrical stimulation (Ojemann stimulator is much cheaper than a complete intraoperative monitoring setup). The only major investment in this is training, and the returns can be heartening! So How Much Should We Resect and What is its Benefit? EOR remains a very important prognostic factor in all types of gliomas (as well as in most brain tumors). Further, this is one risk factor which is modifiable (age/molecular biology, cannot be changed) and is also directly within the control of the neurosurgeon. Yet, the million dollar question still remains! What is the endpoint of resection, and how much should one aim for? This philosophy has evolved over the years. Early glioma surgeons (hampered by limited technology and adjuncts) performed gross debulking surgeries, more as a desperate effort to save lives. With experience, early large institutional studies then suggested a rigid all-or-none criterion. The paper by Lacroix et al. showed that 98% volumetric resection made a significant difference in outcomes. Neurosurgeons were quick to seize upon this evidence to say that if a complete (>98%) resection was not feasible, just a biopsy or intratumoral debulking would suffice. Careful critical analysis of that data as well as studies which evolved over the next decade showed how untrue this notion was. It soon became evident that increasing the percentage of resections (upward of 70%–80%) had an incremental effect on the outcomes and survivals.,, An elegantly performed study by Marko et al. presents a probabilistic model for predicting the survival of patients with GBMs on an individual basis. For example, it is possible using this model to predict the survival for a patient of a particular age and KPS if he/she were to undergo a “x” percentage of resection (assuming adjuvant therapy is taken). Then, the model can also help predict the change in survival if the resection in the patient is extended to say “x + 10” percent. It also shows the incremental benefit of extending the resection in patients in the context of other relevant prognostic factors. Thus, it seems we have turned the entire wheel in glioma surgery– from debulking (gross), to radical all or none and back to debulking (controlled and informed, in the present era) [Figure 1]. Moreover, using advanced intraoperative adjuncts, neurosurgeons can be better guided, and it is also possible to resect beyond “gross total resections”.,, The bottom line, however, remains Safe Maximal Resection. Combination of intraoperative monitoring and mapping is crucial in extending resections as well as improving outcomes.,,, These studies show that with increasing radicality, transient deficits may increase but eventual long-term deficits are fewer and oncological outcomes improve. Aggressive acute and long-term rehabilitation is an integral component of such successful strategies. With recent developments in the molecular characterization of gliomas, our understanding has evolved. Molecular markers are emerging as very important prognostic factors. Whether the preeminence of these biological markers will replace and supplant the role of surgery in gliomas remains to be seen. 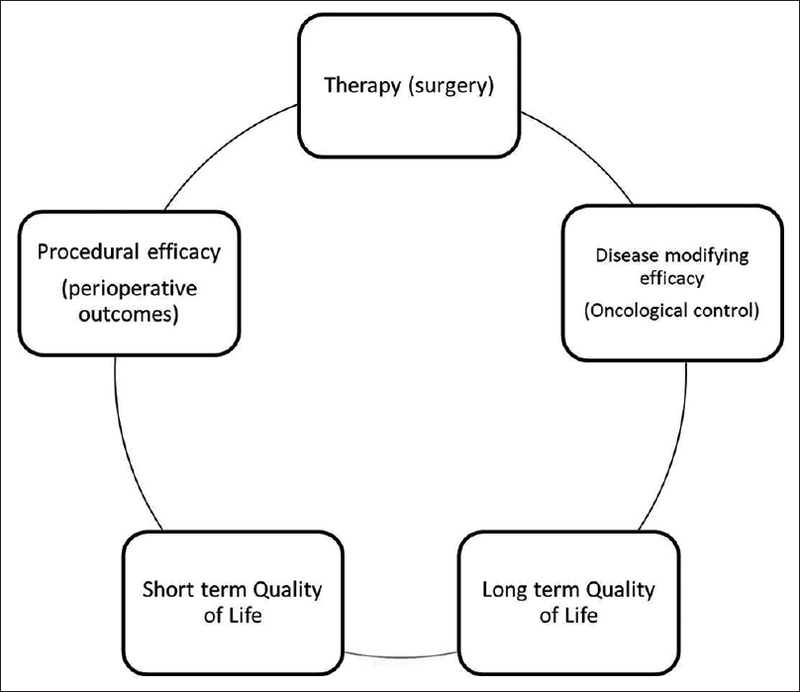 Regardless of the impact on oncological (long-term) outcomes, surgery plays a crucial role in improving short-term outcomes (by way of symptomatic relief and improving quality of life), without which the beneficial impact of further adjuvant therapies and the favorable biology cannot be realized [Figure 2]. Glioma surgery has evolved over the decades. It remains as much an art as a scientifically robust and proven strategy. Improvements in technology and understanding of brain function as well as the fundamental biology of these challenging tumors have tremendously changed the way neurosurgeons deal with these tumors. Nevertheless, experience and individualization of treatment decisions remain the cornerstone of the treatment philosophy. Adapting to the rapid developments in the field is paramount to disseminate the benefits of these advances to the patients at large. Organized consortia and national societies are ideal platforms to facilitate these endeavors. Kelly PJ, Daumas-Duport C, Scheithauer BW, Kall BA, Kispert DB. Stereotactic histologic correlations of computed tomography- and magnetic resonance imaging-defined abnormalities in patients with glial neoplasms. Mayo Clin Proc 1987;62:450-9. Orringer D, Lau D, Khatri S, Zamora-Berridi GJ, Zhang K, Wu C, et al. Extent of resection in patients with glioblastoma: Limiting factors, perception of resectability, and effect on survival. J Neurosurg 2012;117:851-9. Sonabend AM, Zacharia BE, Cloney MB, Sonabend A, Showers C, Ebiana V, et al. Defining glioblastoma resectability through the wisdom of the crowd: A Proof-of-principle study. Neurosurgery 2017;80:590-601. Trinh VT, Davies JM, Berger MS. Surgery for primary supratentorial brain tumors in the united states, 2000-2009: Effect of provider and hospital caseload on complication rates. J Neurosurg 2015;122:280-96. Khan UA, Bhavsar A, Asif H, Karabatsou K, Leggate JR, Sofat A, et al. Treatment by specialist surgical neurooncologists improves survival times for patients with malignant glioma. J Neurosurg 2015;122:297-302. Solheim O, Selbekk T, Jakola AS, Unsgård G. Ultrasound-guided operations in unselected high-grade gliomas – Overall results, impact of image quality and patient selection. Acta Neurochir (Wien) 2010;152:1873-86. Stummer W, Pichlmeier U, Meinel T, Wiestler OD, Zanella F, Reulen HJ, et al. Fluorescence-guided surgery with 5-aminolevulinic acid for resection of malignant glioma: A randomised controlled multicentre phase III trial. Lancet Oncol 2006;7:392-401. Senft C, Bink A, Franz K, Vatter H, Gasser T, Seifert V, et al. Intraoperative MRI guidance and extent of resection in glioma surgery: A randomised, controlled trial. Lancet Oncol 2011;12:997-1003. Duffau H, Mandonnet E. The “onco-functional balance” in surgery for diffuse low-grade glioma: Integrating the extent of resection with quality of life. Acta Neurochir (Wien) 2013;155:951-7. Chang EF, Clark A, Smith JS, Polley MY, Chang SM, Barbaro NM, et al. Functional mapping-guided resection of low-grade gliomas in eloquent areas of the brain: Improvement of long-term survival. Clinical article. J Neurosurg 2011;114:566-73. Chaichana KL, Jusue-Torres I, Navarro-Ramirez R, Raza SM, Pascual-Gallego M, Ibrahim A, et al. Establishing percent resection and residual volume thresholds affecting survival and recurrence for patients with newly diagnosed intracranial glioblastoma. Neuro Oncol 2014;16:113-22. Marko NF, Weil RJ, Schroeder JL, Lang FF, Suki D, Sawaya RE, et al. Extent of resection of glioblastoma revisited: Personalized survival modeling facilitates more accurate survival prediction and supports a maximum-safe-resection approach to surgery. J Clin Oncol 2014;32:774-82. Schucht P, Knittel S, Slotboom J, Seidel K, Murek M, Jilch A, et al. 5-ALA complete resections go beyond MR contrast enhancement: Shift corrected volumetric analysis of the extent of resection in surgery for glioblastoma. Acta Neurochir (Wien) 2014;156:305-12. Dubey S, Janu A, Chaudhari S, Moiyadi A. Navigable 3D-ultrasound facilitates supra-radical resections beyond the contrast-enhancing boundaries in malignant gliomas. J Neurol Surg A Cent Eur Neurosurg 2016;77:372-5. De Witt Hamer PC, Robles SG, Zwinderman AH, Duffau H, Berger MS. Impact of intraoperative stimulation brain mapping on glioma surgery outcome: A meta-analysis. J Clin Oncol 2012;30:2559-65. Carrabba G, Fava E, Giussani C, Acerbi F, Portaluri F, Songa V, et al. Cortical and subcortical motor mapping in rolandic and perirolandic glioma surgery: Impact on postoperative morbidity and extent of resection. J Neurosurg Sci 2007;51:45-51. Jakola AS, Unsgård G, Solheim O. Quality of life in patients with intracranial gliomas: The impact of modern image-guided surgery. J Neurosurg 2011;114:1622-30.